The name of the band is in big letters, which is considerably larger than the rest of the text in the advert. The white text contrasts well with the sea background, which I am guessing has some connection to the album theme. The image is very central, and is really clever, showing the album within the album. I really like this idea, however I do not believe it will be suitable for my genre. The overall effect is good with the image showing an instant recognition and the main focal point. The text is in the same font as the band name which shows the connection between the two products. - phoenix. 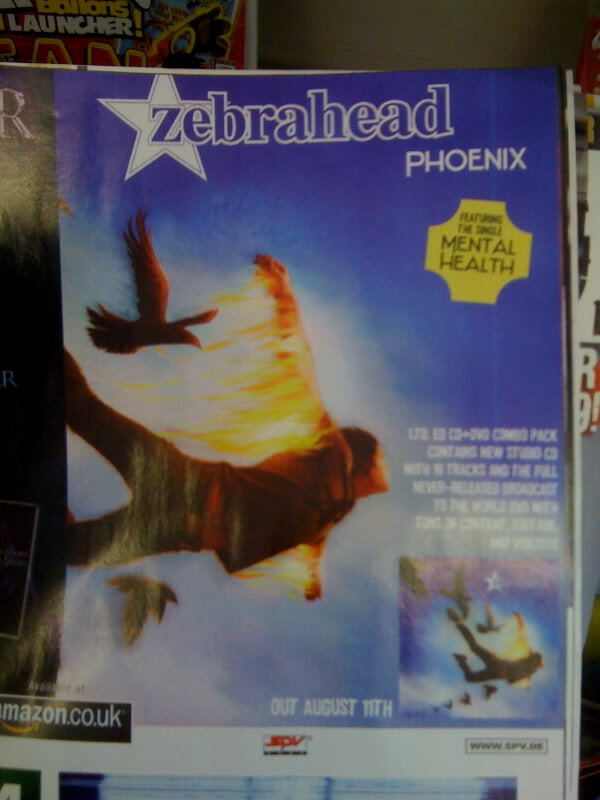 The imagery immediately shows a connection between the advert and album name by using the fire wings. - The album cover design has become the advert which I do not really like because the advert looks too busy. However it does create audience recognition of the album cover if they wish to go and buy it, they know what to buy. - all the text is in the colour of white which stands out nicely upon the background. -The imagery I over to the left allowing space for the text on the right which shows it is proportional. -overall I would not really use the features from this advert in my own as although the idea is good, it is too busy and I do not like the idea of the album cover becoming the whole advert.